When 2013 commenced, I dusted off two bins full of all the illustrations that I have created over the last ten years. JP reminded me that it was a shame to keep all of those pretties locked up in a box, and that perhaps I should rediscover long-lost works. I enjoyed the process, reminiscing over this and that and marveling over some compositions that never even left my studio. Eventually, I came across a spring cone that I illustrated one decade ago. Excited by the imagery I dreamt up for this sweet design, I was inspired to scan it and remaster it, so to speak. After several hours of touching up my old line art, I pressed print, and Voila! The results are below, and since tomorrow is the first day fo Spring, I am going to share it with you! We hope this project inspires, excites you for Spring and "eggs-you-on" to CREATE! Get out your scissors and glue and go digging in your drawers. DOWNLOAD and print this sweet tussie mussie, decorate and fill it with delights! Make one for yourself and one for a friend. In fact, wouldn't it be delightfully fun to hang a treat-filled cone on a neighbor's doorknob or wall-hook, ring the bell and run? And if that sounds too fanciful, I'm sure your kids will play along! Make it fun, and enjoy the process of creating something with your hands amongst family and friends. Now, promise that you'll send me photos!.... It's all about sharing, so I'm giving you this file. In return, you share your finished photos or perhaps images of you, the crafters creating and/or decorating your cones. Please EMAIL ME your photos for the purpose of sharing or post them on my Facebook page. 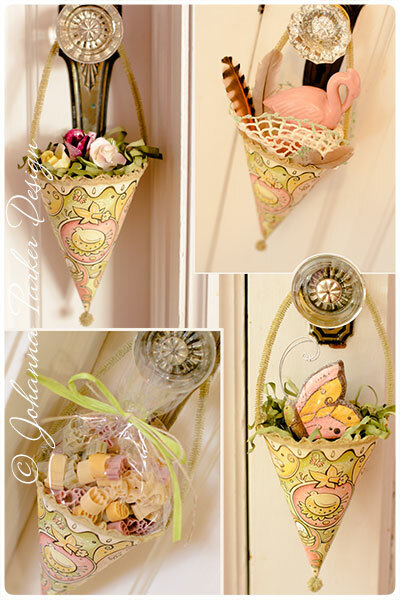 * Since we did not have any Easter candies on hand, I looked around the house for vintage finds that I could add to my cone. 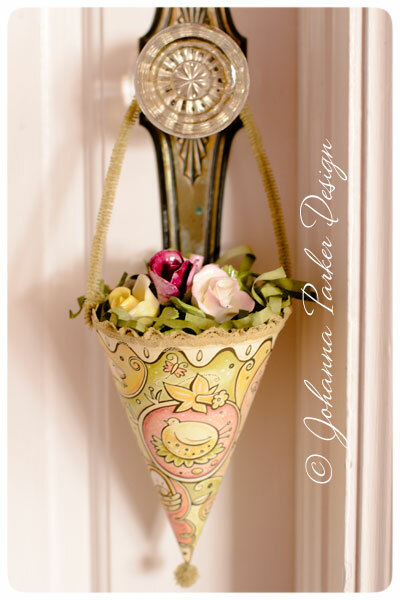 Above, a trio of porcelain roses peer out of a bed of paper grass, serving as a sweet topper for this adorable cone. 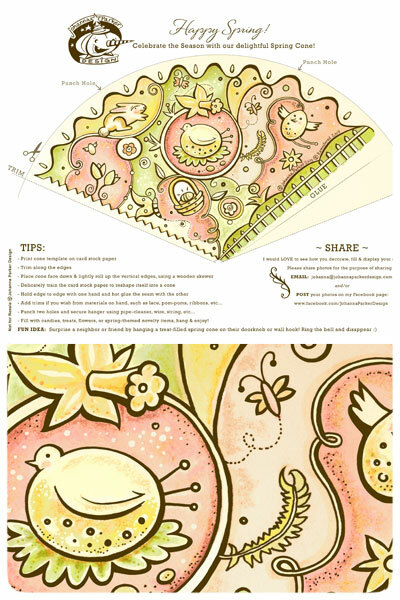 Download & ENJOY our Free Printable PDF file to create your very own Spring Cone! * After I glued my cone, I decided to accent it with two white pipe cleaners and a piece of vintage white lace. 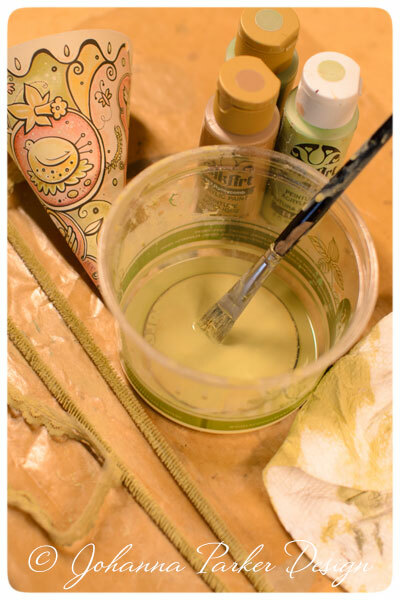 I altered their white color by adding a few squirts of pale green and soft brown paint to about 2 tablespoons of water in an old cup. Blending those ingredients with a brush made for a nice wash which I applied to my accessories. 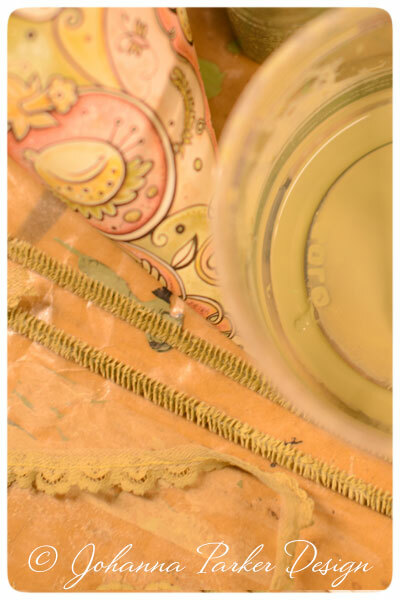 * And the result was a lovely aged chartreuse hue ~ lovely matching textures to adorn my spring cone! Of course, this is just one idea from a myriad to choose from. Get creative and dig through your drawers to see what may surface..... twine, ribbon, string, tinsel, old buttons, felt, pom-poms, rick-rack, fabric scraps and the list goes on!... Have fun!